Imagine this...you are at a wedding and you just successfully fought your way through the groups of wedding-goers to find the little table holding the placecards. And the winner is...Table 12 for the evening. You hand it to your date for safe keeping and he proceeds to turn it into a paper airplane before crumpling it up and stuffing it in his pocket. Men... Nearby, the bride is dying a little inside as she sees her $2-each "necessities" getting destroyed, never to be seen again. Or worse yet, did she just pull an all-nighter trying to get them finished in time? Eek! As you plan your own big day, you wonder, "Is this the way it has to work?" Do I have to spend hundreds of dollars or countless hours on placecards that leave no lasting impression? Of course not! You don't have to force your grandparents to hunch over a table of tiny cards when you can display their names in a beautiful, framed seating chart. 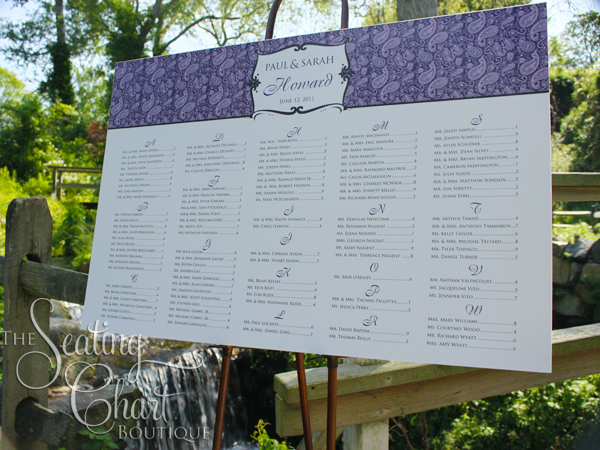 Wedding seating charts elevate the everyday placecard to an elegant showpiece that will carry the colors and theme of your wedding and will be remembered long after guests leave the cocktail hour. They also make excellent alternatives to the neglected guest book as they already have everyone represented. Some brides even display their charts in their home as a memory of the day and who they spent it with. Try that with a table of placecards. 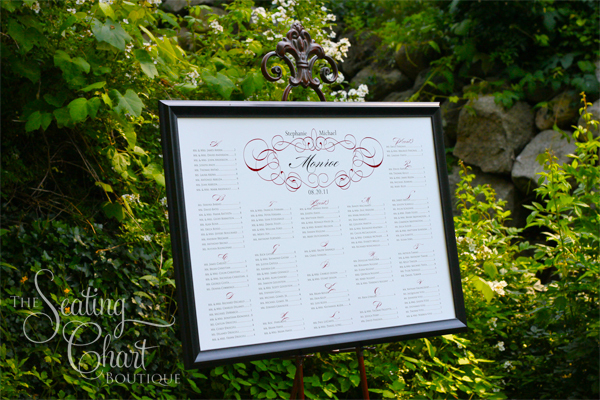 Seating charts are a hot new trend in the wedding industry but they are really not new. At the Seating Chart Boutique, we have been doing them for years. Our brides are generous in their accolades about the quality of the printed product and the ease of working with us. We take great pride in the fact that we can deliver excellent quality at such a great value. 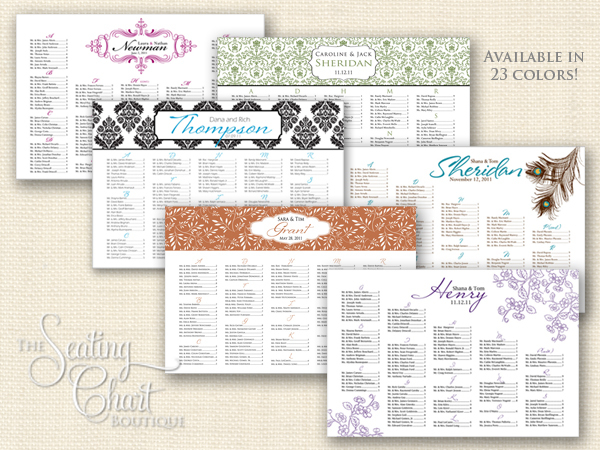 In many cases, our seating charts cost less than the placecards they replace! So if your wedding is just around the corner and you are looking to put a twist on the same old routine, consider the impression a beautiful wedding seating chart will have on your friends and family. Not only will it welcome them into your celebration with style, but it can be yours to hold onto for years to come. To see more of our designs or learn about our custom design capabilities, please visit www.seatingchartboutique.com.